Roundthorn Country House Guest AccommodationThe Roundthorn is a Grade II listed Georgian mansion is set in its own landscaped grounds and enjoys panoramic views of the Eden Valley, the Pennines and Lakeland Fells. Overlooking the busy market town of Penrith, the Roundthorn Country House is located in an extremely peaceful and secluded environment, only minutes from the M6 and A66 and is the perfect base to explore the Lakes. All of the en suite rooms are unique in character and furnished to the highest standard and the house has its own bar/lounge and a cosy residents' lounge with a real fire. Served in the Eden Room each morning, the Great Cumbrian Breakfast is guaranteed to prepare you for the day ahead. Evening meals are served in the bar lounge areas and are prepared using only the freshest locally sourced ingredients. 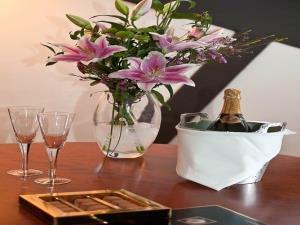 Whether your stay is for business or pleasure, the Roundthorn is the perfect choice. Complimentary Wifi. Twin rooms are available at the same rate subject to availability. Travelling from the South - From Junction 40 of the M6 take the A66 towards Alston. At the next roundabout take the A686 again towards Alston. After 3/4 mile turn left (signed Roundthorn) and turn left at the T junction. After approximately 500 yards turn right for Roundthorn. Travelling from the North - At M6 junction 41 take the A6 towards Penrith. On entering Penrith turn left for Langwathby & Alston (A686). After 1 1/2 miles turn left for Roundthorn.